ARLINGTON, Va., May 8, 2017 – Boeing [NYSE: BA] and the U.S. Air Force recently demonstrated that multiple aircraft and ground stations can efficiently and securely communicate using the Boeing-developed Talon HATE airborne networking system. During flight testing at Nellis Air Force Base, Nev., Talon HATE pods on two F-15C aircraft enabled test pilots to share information through the military’s Link 16, Common Data Link and Wideband Global SATCOM satellites. The tests also validated intra-flight datalink network capabilities used by F-22 aircraft. 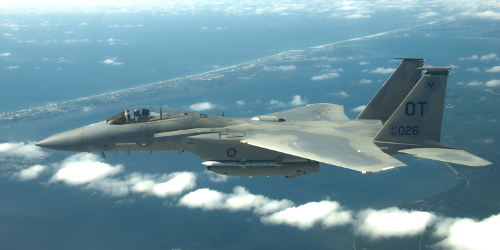 Pilots using the system can transmit information quickly between the F-15C and other Air Force aircraft and weapon systems, enabling efficient information sharing in real time. Boeing will conduct additional tests later this year with advanced sensors, which will offer improved aircraft targeting capabilities.